In Japan, where Buddhism and Shinto are the main beliefs, a sports and cultural events company decided to create a safe and spacious environment for Muslims in Tokyo for the 2020 Summer Olympic Games. The games are going to be held in Japan’s capital, Tokyo. The purpose of the mobile mosques is to aid Muslims in praying wherever they go as they move from stadium to stadium to watch the summer games. Japan does not have any mosques; the country holds 100,000 to 200,000 Muslims. 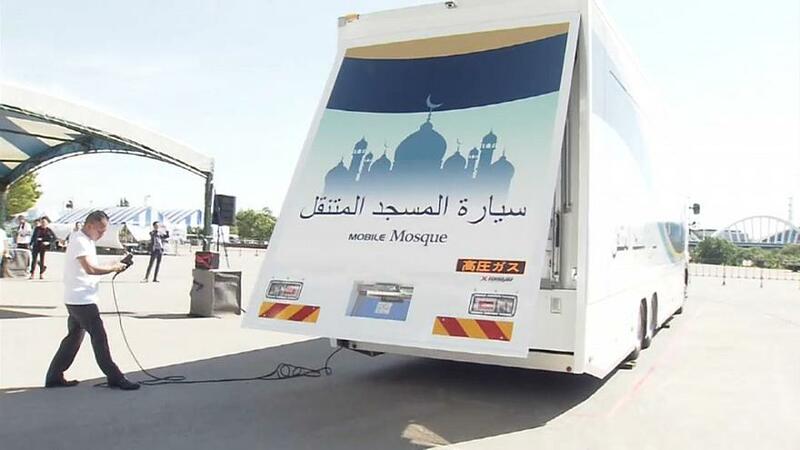 The first mobile mosque of the project was shown publicly outside of the Toyota Stadium in Toyota, Aichi Prefecture. The mosque is air-conditioned, 515 square feet, and can hold up to 50 people. The whole weight of the mobile vehicle is 50 tons. The truck also includes an area with water taps where Muslims can perform wudu, the cleansing ritual for the body done before every prayer. The truck gives off a Muslim-themed ambiance, with white and blue designs depicting mosques and domes covering the vehicle. The truck also states that it is a “moving mosque” in Arabic. Arabic is the language the Quran, the holy book Muslims abide by. The CEO hopes to show the world that everyone can live peacefully together in the world. A Japanese guest speaker, Tatsuya Sakaguchi, expressed his gratitude for the project. He noticed the people in the mosque were happy to be there and have access to a place to pray. It seems like the mobile mosque may be the first project of its kind. The committee plans on bringing the project to many international sporting events like the Olympic and Paralympic Games, the Football World Cup, the Rugby World cup, Asian Games, World Championships in Athletics, World Aquatics Championships, and the World’s Fair (International Expo). Many Japanese municipalities are starting to build mosques and halal food sites for their Muslim residents and visitors, promoting an all-inclusive image for Japan. For more information, check out the Mobile Mosque’s website here. What Does An All Muslim American Cast Look Like?